From Chicago to Peoria to Springfield and beyond, Stratos Jets provides service throughout Illinois. We work with carrier partners at over a hundred airports in the state. Every private jet charter flight we arrange is led by two experienced pilots. We work with only the best carriers to help you Soar Higher™, wherever you might need to go. Stratos Jets is a different kind of private jet charter broker. We do more for our clients in Illinois and elsewhere than any other company. Our founder created Stratos to meet the needs of private jet charter users. 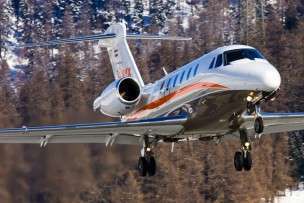 Many brokers treat charter travel as a commodity. While that might allow for low prices, safety and service will suffer. Stratos Jets has a different mission, and it guides us in everything we do. For every private charter flight from Illinois or anywhere else, Stratos strives to exceed expectations. Our focus on quality means safer flights and better service for our clients. We stand out from the rest in many important ways. Due Diligence That Goes Deeper. Every private jet charter broker in Illinois claims to vet its partners. We go much farther than others to make sure carriers are worthy of the trust our clients place in us. On top of F.A.R. Part 135 compliance, private jet charter carriers we work with must live up to stricter standards, as well. Our Approved Vendors must possess long records of safe operation and financial strength. Third-party safety auditing by ARGUS and Wyvern ensures that nothing will be overlooked. Our operational standards are the strictest in the industry, putting safety first with each and every flight. Whether setting off for Chicago or heading to Champaign, Stratos clients can be sure that safety will never be compromised. One of the First ARGUS Certified Charter Brokers. ARGUS International commands respect worldwide for its work on aviation safety. Stratos Jets was one of the first to become an ARGUS Certified Charter Broker. ARGUS audits establish the quality of our processes, ranking Stratos at the top of the industry. We would work just as hard on our own, but we are proud of this independent mark of distinction. Fly with an Industry Leader. Stratos was created to elevate the status quo. We have led the private jet charter industry since our founding, and it shows in our everyday service and work. Over the years, we have spread awareness as to best practices and procedures that benefit everyone. Our work as a member of ACANA has helped other brokers offer safer, better service to clients. Stratos supports the important mission of the Air Charter Safety Foundation as an active member. Safer standards and better risk management elevate the value of private jet charter service in general. Stratos is proud to lead the industry in this and other respects. Real Peace of Mind. Stratos clients can also rely on industry leading coverage in case something should go wrong. Every one of our carrier partners carries millions of dollars in coverage per passenger. With an average of around $25 million in liability insurance for turboprops and $50 million for jets, our partners stand behind their safety systems. Our own $25 million coverage adds to the total for every flight. That helps our clients relax and enjoy their travels even more. Chicago alone draws many thousands of business travelers to Illinois each month. At Stratos Jets, we provide every client with the kind of service that always stands out. Along with safety, service is the other pillar of our mission. It is part of what makes us different from the rest. Anyone boarding a private jet charter flight in Illinois will see how our service excels. Teams of Experienced Agents. With over 5,000 aircraft in our network, our agents can make any flight happen. In a day or less, our veteran agents can find the perfect aircraft for any flight to Illinois or elsewhere. Whether for a one-off trip downstate to Springfield or by adding a stop in Chicago, our agents are driven to exceed expectations. Stratos agents keep clients in the loop without distracting them with useless details. Our customers thereby enjoy private jet charter flights from Chicago and other Illinois cities that better suit their needs. Full-Service Trip Support. Our commitment to service extends to every aspect of a flight. Once our agents have made arrangements, our trip support team takes over. Our advanced trip management system keeps every detail in focus and every party in the loop. Stratos trip support specialists stand ready, around the clock, to respond with any adjustments that might need to be made. By taking charge of every detail, they minimize delays, improve reliability, and elevate the customer experience. Stratos Jets clients in Illinois and elsewhere can count on trip support service that caters to their every need. Illinois is a dynamic, thriving state. Bustling, business-oriented cities lie alongside agriculture and natural resources. All this makes the Illinois economy one of the most diverse in the country. That makes it a place of great interest for a wide range of travelers. Stratos Jets serves the entire state at the same high level. Safety and service go hand in hand at a hundred-plus airports with Stratos private jet charter flights in Illinois. Chicago is the historic heart of Illinois and one of the world’s most exciting cities. The Chicago Mercantile Exchange is a futures marketplace of global importance. Dozens of major companies make their home in Chicago and its suburbs. Around 4.5 million workers contribute to the economy of the area. Add the city’s rich history and culture, and Chicago is a major destination in a great many respects. Whatever their goals, many Stratos clients find that Chicago Executive Airport (PWK) or Dupage (DPA) make for convenient landing or takeoff points. Chicago Midway International and other area airports extend the list of options. Other common private jet charter destinations or departures in Illinois include Rockford, Springfield, Peoria, and Champaign. With partners at airports throughout, Stratos covers the entire state. Our clients can choose from over a hundred airports and be sure of the safety and service Stratos is known for. Search our Illinois airport directory for airport codes, runway information, available charter aircraft and FBO Information as well as empty leg jet charters in Illinois.